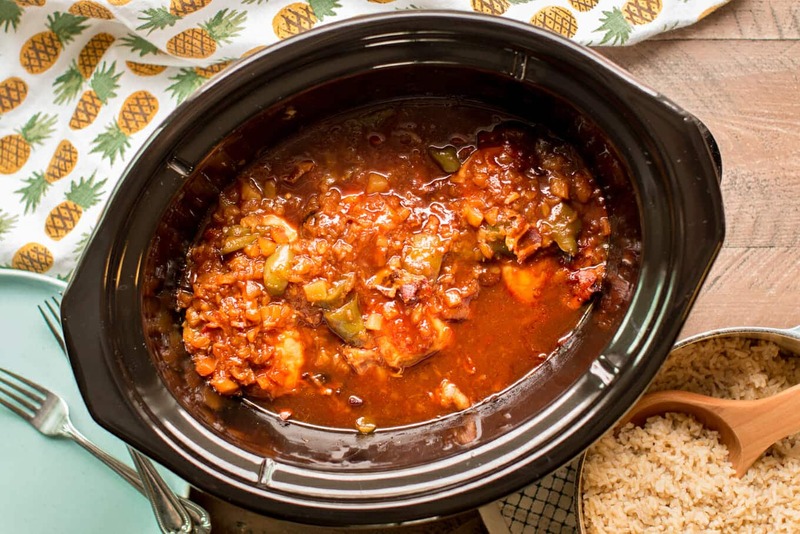 Slow Cooker Hawaiian Chicken is sweet and tangy, great over rice or even buns! This isn’t an authentic recipe, but sure is delicious none the less. My grandmother is full blood Hawaiian, but sadly I never got the chance to meet her. I hadn’t planned on sharing this photo but I just saw it for the first time not too long ago. Here is my grandma Rosie and my mom and dad, like a hundred years ago. I’ll have to ask my dad how old she is in this photo. 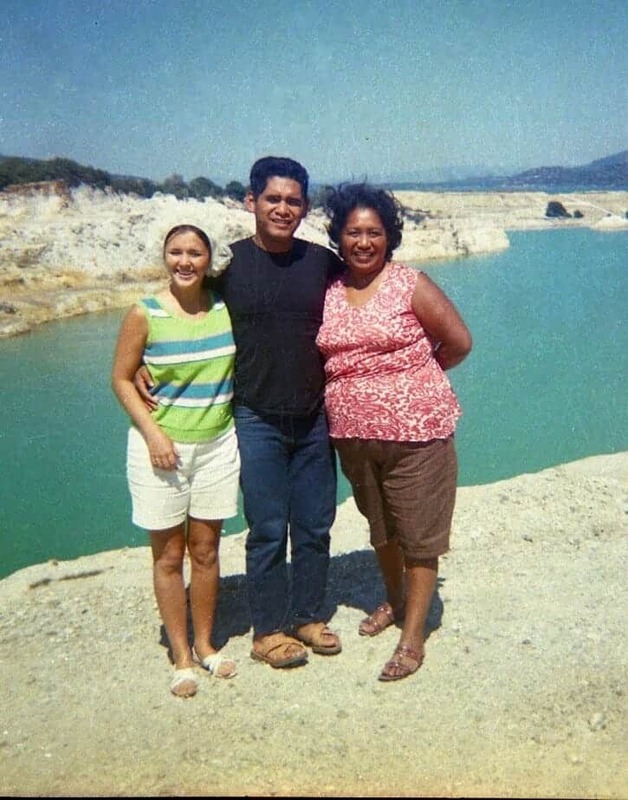 The photo was taken near our Indian reservation in Lakeport, California, my dad is part Native American too. I have 3 older brothers, I came much later after this photo. 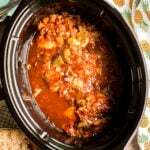 I enjoy easy recipes like this that don’t need much work after I get home, I put on a pot of rice and can get dinner served right away. The sauce is quite thick even with the added pineapple, but be sure to drain the pineapple very well! Above is the chicken after I shredded it with 2 forks. I served this chicken over brown rice though white rice is just as good! Next time I make this I am going to serve on hamburger buns with macaroni salad. 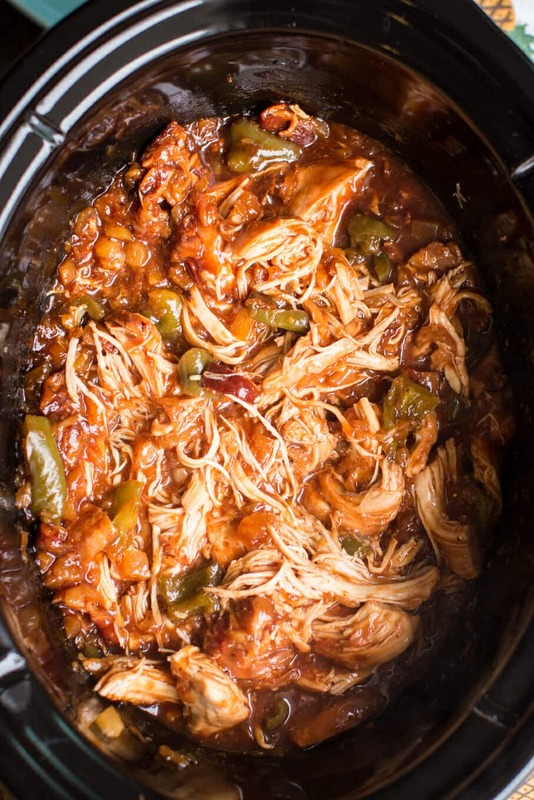 Here is my YouTube video on how to make this Slow Cooker Hawaiian Chicken. You can follow me on YouTube, here. 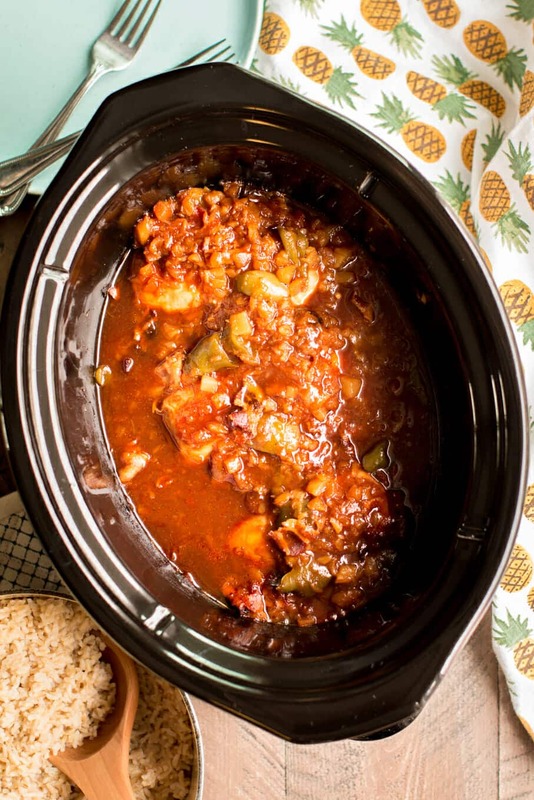 This chicken has barbecue sauce, crushed pineapple and even bacon! Great over rice or even buns. Add the chicken breast to the slow cooker. 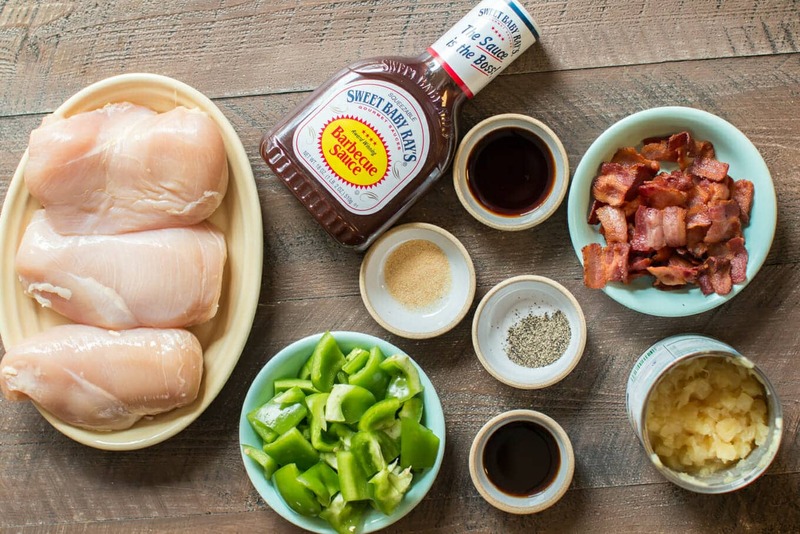 Add remaining ingredients and stir the toppings on top of the chicken to combine. If desired shred the chicken. Serve over white or brown rice, or hamburger buns. Enjoy! One question on this. Sounds great.May be a stupid question but here goes. You say cook the bacon. How? I like my bacon crisp. Do you cook it in a skillet? Leave some drippings? Cook half way and then add for the 6 hours? Thanks. I made this it was so good thank you for sharing Sarah..
Do you HAVE to use the bell pepper? 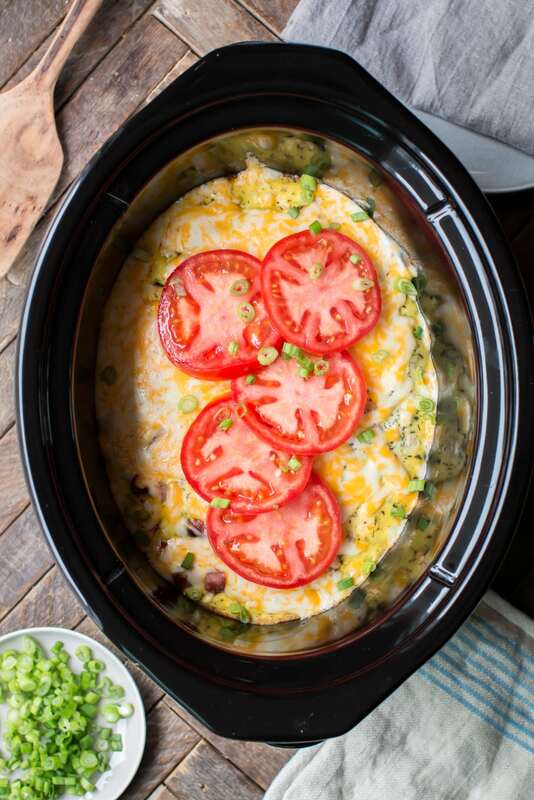 What temperature and amount of time would you recommend if this was cooked in a glass baking dish in the oven instead of a slow cooker? In your recipe can I omit the Bacon? 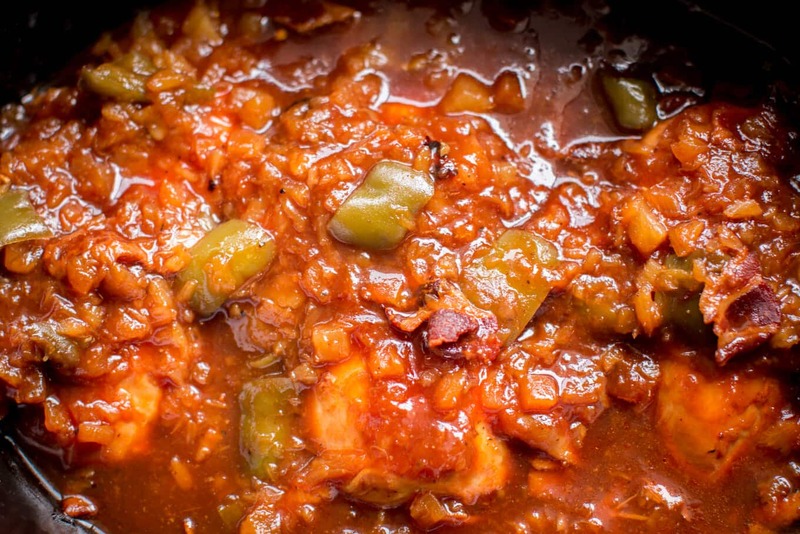 And those recipes that you use Chicken Thighs, can you use skinless Boneless Chicken Breast?